“Since it is not by merit we rise or we fall, but the favour of Fortune that governs us all.” That sounds like nothing so much as a life philosophy for the lazy and overprivileged, and when sung by the indolent Tom Rakewell, the protagonist of Stravinsky’s opera The Rake’s Progress presented at the Peacock Theatre by the British Youth Opera. It’s a foreshadowing of his swift rise and and even speedier fall, the result of a deal with the devil gone horribly wrong. 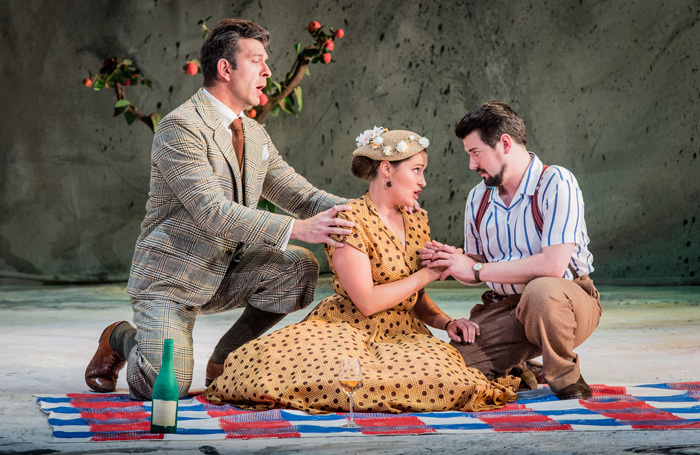 With a chirpy neo-Classical score by Stravinsky, a clever libretto by WH Auden and Chester Kallman, and stylistic nods to Mozart throughout, this opera has earned its place in the repertoire. Although there are many fine moments in the BYO production, it is not entirely effortless. In smaller scenes, the drama sometimes stalls and singers struggle to project Auden’s witty words clearly across the deep Peacock Theatre stage. The energetic crowd scenes are excellent, however, such as the hilarious auction in which would-be buyers throng ecstatically, greedily handling the flashy possessions that once belonged to Tom and his wife. That scene is also a visual highlight of James Cotterill’s mid 20th-century costume design. As Anne Trulove, hopelessly devoted to the feckless Tom, Samantha Clarke’s vivacious personality and vibrant soprano make her the standout among the cast. There’s good characterisation from Jessica Ouston as the outspoken Baba the Turk and Sam Carl as the matey yet sinister Nick Shadow. Frederick Jones in the gruelling role of Tom Rakewell is at his most affecting in the final scenes, playing a destiny-changing game of cards or crumpling into confusion at the insane asylum. Stravinsky was inspired to write The Rake’s Progress after viewing the William Hogarth paintings of the same title, and the programme for this production of the 1951 opera reminds us that the Peacock Theatre is just round the corner from Sir John Soane’s Museum, where the Hogarth paintings can be seen.